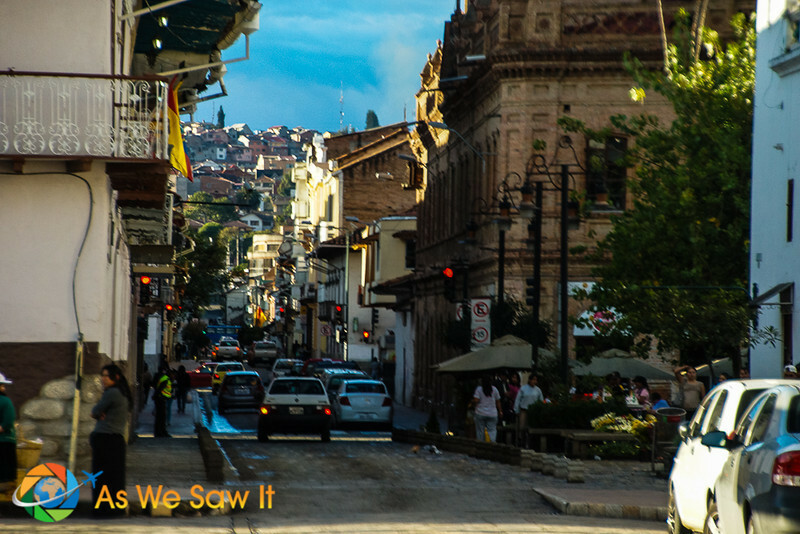 When we told local friends we were looking to rent a furnished apartment in El Centro, Cuenca's charming historic district, their response was, “Why would you want to move there? It's so noisy and dirty.” “Not to us,” we responded, “It's perfect.” We had quickly tired of the cold sterility of our Gringolandia apartment, where the only contact we ever had with our neighbors came on a 15-second elevator ride. We wanted to live with the locals. We wanted an Ecuadorian apartment, in an Ecuadorian neighborhood. As I've mentioned before, Cuenca is 500 years old, a blend of colonial Spanish architecture and Indigenous cultures. Its buildings and streets are old, really old. Actually, the cobbled streets are a big part of what gives the city its charm. We wanted to walk out of our apartment and be in the middle of all that. I started searching on the internet and googled “rent a furnished apartment in cuenca.” Just so you know, that doesn't work nearly as well as checking GringoTree,the Cuenca expat website. It might have been a fluke but we immediately found an ad that sounded ideal. Our realtor explained that it would cost $450/month, including electricity, water and cable TV/internet. “The only thing is, there's no washing machine or dryer so you'll have to bring your laundry downstairs. The landlady will wash it for you.” Are you serious? Oh, yeah, we could certainly deal with that. The biggest differences between an Ecuadorian apartment in Cuenca downtown and a place on the outskirts are the age and size of the apartments and the fact that apartments in El Centro require a propane tank for the water heater and cooking. Our first tank lasted almost 3 weeks before we had to get a refill, and the man who refilled it brought it up and connected it. What service! At $2.50 it can hardly be considered a hardship. Come to think of it, this is just part of the charm of being in another country. It's a small place, just two bedrooms, two baths, a living/dining area and a tiny kitchen. (See? There's not even enough room in the kitchen for the fridge!) But no matter; it's big enough for the two of us and there's a second bedroom for any guests who will (hopefully) visit. It's also exciting to know we're saving at least $330 a month by living here. Thanks to a wall full of windows the master bedroom has lots of light. The bed's mattress is pretty comfortable, though I can't say the same for the pillows or the sheets. That's one of the bad things about living in Ecuador: Quality sheets are ridiculously expensive, and the cheaper ones are uncomfortable because they get those little pills (balls) all over them. So if you plan to move to Ecuador, buy your sheets before you come. Same thing with the towels, if you like them thick and fluffy. We brought our own bedspread, sheets and pillows from the other place. I prefer my own bedding and this decor is really not to my taste anyway. Ecuadorian bedrooms have no closets. 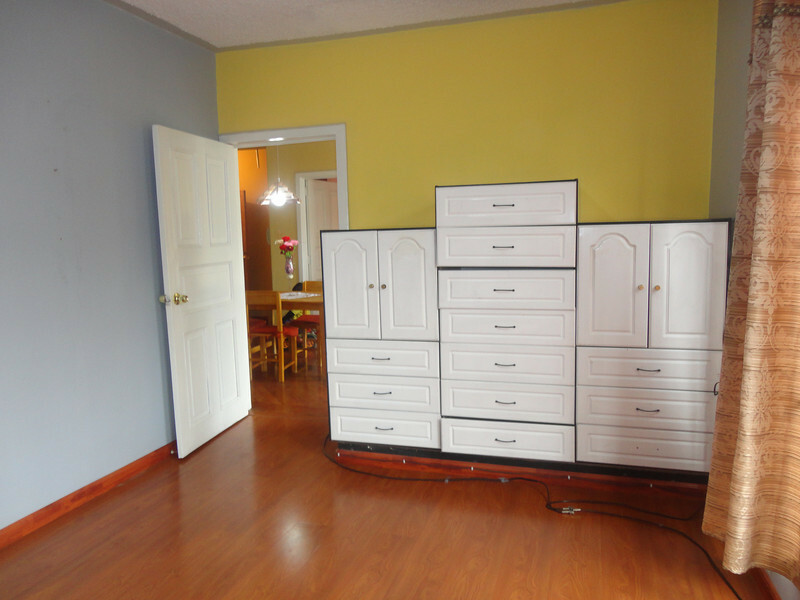 Instead, one wall is lined with cabinets and lots of drawers. I think that's more than enough storage room for any couple. All our master bedroom lacks is a place to hang dresses and coats, which is no problem; there's space in the other bedroom. Notice the cable running across the floor? It supplies the cable signal for the TVs in the two apartments on this floor. That silver thing is the signal splitter. There's a lot of goofy wiring going on in these buildings. An American electrician would have a coronary. Since no one is staying here at the moment we store our empty suitcases in the upper cabinets. The ones at eye level hold our hanging coats and my dresses. My heart melts every time I see Mathias, Veronica's little, adorable-but-shy 2-year-old, hide behind her and wave at me. I don't remember seeing any kids at the other place in Gringolandia. Ever. And even though we're newcomers and foreigners we have been made to feel welcome. Veronica and her husband have invited us to use their home's huge outdoor fireplace at any time, either to warm up with (it's cold season now!) or to grill steaks on. She smiles when I bring her our laundry. And she's extremely helpful as we try to learn Spanish. Twice a week a fruit truck trundles by, advertising “sweet oranges, 25/$2!” from its loudspeaker. Our street is on one woman's route, who calls out to folks hoping for a lucky break; she carries a roll of lottery tickets in her hands. A pickup truck arrives every Wednesday morning so we can have our containers refilled with milk fresh from the farm (60 cents per liter). And every three weeks we begin to listen for the insistent honk that tells us the propane truck is on its way. We will wave to him from our window and hope he sees us and stops. This is why we left the sterility of Gringolandia and got an apartment in Cuenca's El Centro. This is Ecuadorian life, and we are happy to be a part of it. Read more about Cuenca in these Amazon books. For more photos of Cuenca, please enjoy our Ecuador photo gallery. Why Is Cuenca, Ecuador a UNESCO Site? I’m thrilled that you found our articles so helpful! I hope Kirtland doesn’t let her lack of Spanish skills deter her from teaching in Ecuador. If she is in Cuenca she’ll find a good group of expats who can help her get oriented. Please don’t hesitate to contact us if you have any other questions. God’s blessings to you all on your journey. I would love to be there in such beautiful apartments having good combination of colour and accessories both. I liked the idea of big window panes which is allowing the sunlight to come inside the room that can be a lovely experience especially in summer days. I wish I could also find a landlady as good as yours! might as well move to Ecuador. haha! 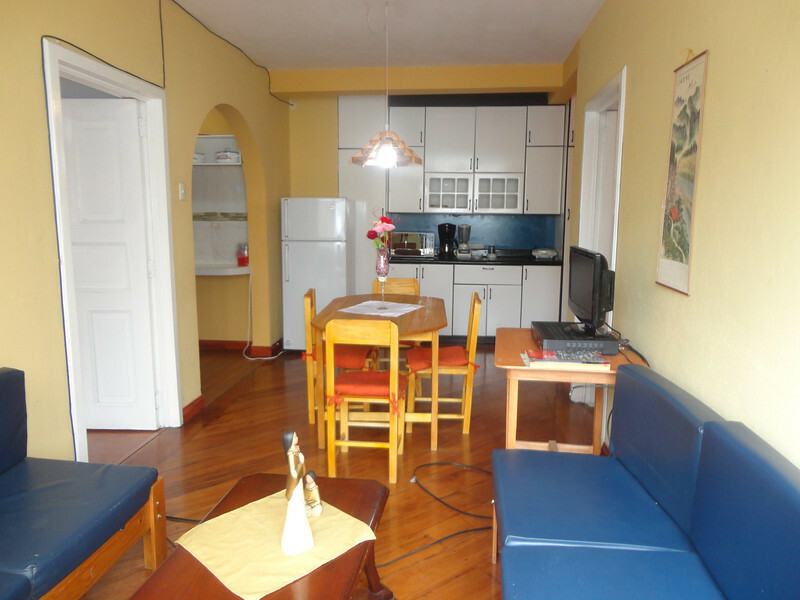 Since you’re in the apartment business, you might also enjoy reading our additional article, How to Find and Rent an Apartment in Cuenca, Ecuador. I really like the look of your new apartment! It seems to be pretty authentic, like you mentioned. It’s amazing that it came furnished. My wife and I are looking for an apartment right now and I really like the idea of moving somewhere with furniture already there. It makes things a lot easier when you’re moving in and out. We bought furniture for one apartment and it really drained our funds. Not only was it expensive, it also took a lot of our time. You’re right that it is easier to rent furnished. We plan to do that from now on … at least until we settle somewhere permanently. 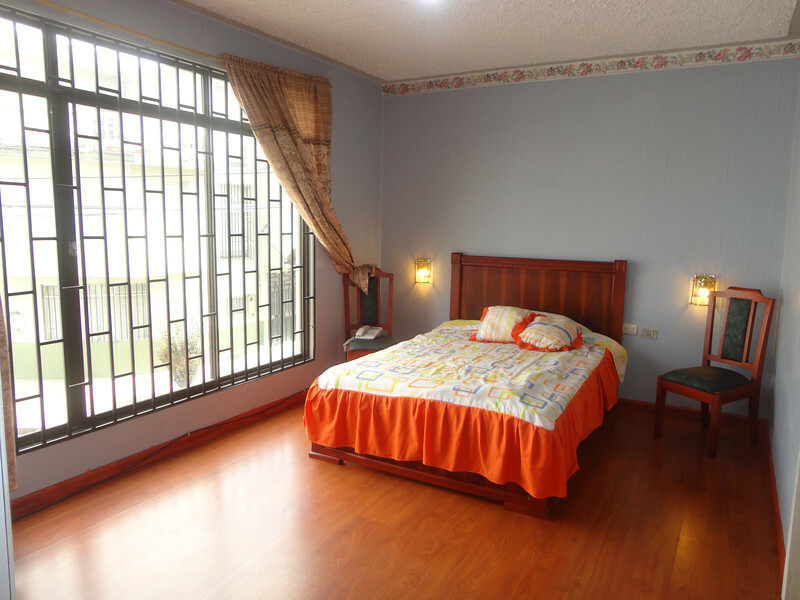 My wife and I are coming to Cuenca in late Oct of this year and we want to find a place to rent that has 2 bed and at least 1 bath plus furnished with all utitilies so that we can stay for about 5 months. If you could tell me of someone to contact that sure would help. We have been to Cuenca twica an love it, now we may buy this time. so we need to look and see, would like to stay close to mid city. Sure, Greg. We found our first apartment in GringoLandia through word of mouth from a gringo we had been corresponding with. Roberto Cruz at GringoTree helped us find our next place in El Centro, which was more to our liking and $200 less per month. Here’s his website: http://www.gringotree.com/realestate/ecuador/. Good luck and let us know how it turns out! On a totally separate note, i recently read that a lot of xpats are leaving Cuenca due to the rain and the pollution in el centro. I was wondering what your thoughts are on that. Well, contrary to what International Living says, Cuenca’s not a utopia and it’s not for everyone. Some consider it too cold, some say it’s too dirty, some don’t like the weather. (Read this TripAdvisor post about it too.) Personally we found June-September to be a little too cold and had to buy an electric heater. (That is due to winter winds from Patagonia.) It’s also cloudier than I prefer, but no more so than New York in the winter. They plan to replace the diesel buses in El Centro with an electric tram system so the pollution may be on its way out. Hi Linda. Thanks for the response and for the recommendation to contact Roberto…we will definitely do so. I also like your idea of renting a room initially but that could be tricky as we have to smalldogs s well. I know that will ake home hunting significantly more challenging, but we are ok ith that. We re planning to arrive at the end of September/beginning of October. Will you be around? It might be tricky but I know that Pilar let our Airbnb housemates bring their two dogs. As for the fall, we attended blogging conferences in Europe the last two Octobers, but no one’s announced any event dates yet, so who knows? Hi Linda, I love the new apartment and am so excited to have found your site. 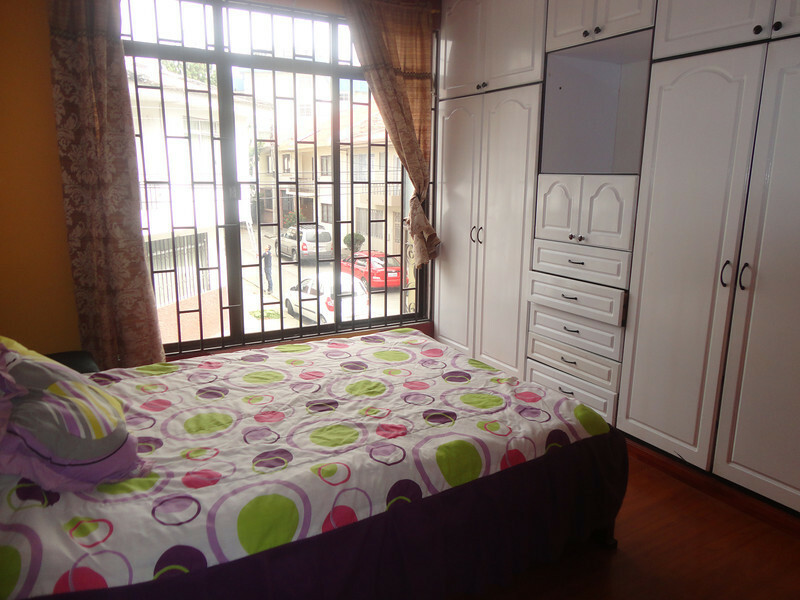 My partner and i are moving to Cuenca in the fall and we have been browsing the net looking for furnished rentals. It was a bit discouraging to see so many box-like, sterile units in gringolandia…and then we stumbled on this post and are re-invigorated in our search. You recommended gringo tree as a viable source for rental info. I read it daily but wasnt sure if its real estate listings catered more to the monochrome gringos looking for safety and familiarity as opposed to adventure. Thanks for the confirmation. Just wondering if you have any other recommendations for places to search for accommodations. We are initially looking for short term furnished near el centro so we can take some time to explore different neighbourhoods when we get there. Thanks again. I hope we may get a chance to meet when we land in Cuenca…you sound like wonderful people. Hi Richard, I am not a fan of Gringolandia. It’s sterile and too far from everything, plus it’s hard to make friends in a highrise. We actually rented our first apartment there … found it thru word of mouth. We made a video of it apartment too, so people can see what one is like. If you’re looking for a short-term rental and you can’t find anything you like, you could try Airbnb.com. That’s what we did. We actually chose to rent a room instead of an entire apartment when we first arrived, because we wanted to get tips about Cuenca from our housemates. The GringoTree rentals do vary – everything from Gringoland to El Centro – which makes sense since not all expats want to insulate themselves. We were very happy with the apartment Roberto found for us, actually moved to a larger one upstairs because we liked it so much. Why don’t you contact him directly and let him know what you’re looking for? His email is realestate@gringotree.com. Please tell him we sent you and send our greetings. Hope to meet you in Cuenca. When do you plan to go? Oh my god, what is not to like on that apartment?! It is so nice, Linda. You were not wrong of choosing to live there. If I were in your place I would also chose the same. I hope you can also share the new place you mentioned that you are moving into. I am excited with your stories. I’ve lived overseas a couple of times and I always lived amongst the locals. The whole point for me was to learn the language and culture and the best way for me to do that was to live where I would be forced to speak the language and live the culture. I was in Ecuador last year and we were in Quito. We also rented an apartment right in a neighborhood filled with locals. It was great! We totally agree. Where was your favorite place to live so far? Thanks for sharing the new apartment. I am looking forward to seeing the next one also!!!! Also looking forward to meeting the two of you one day along the road somewhere!! That would be fabulous, Kim. We are very much looking forward to meeting you as well so I hope you can return to Cuenca soon. 🙂 Then you can see our new apartment firsthand. You guys found a great place! Love it and especially those windows in the master bedroom! Thanks, we love the big windows and especially all the afternoon sun shining in! My parents travelled a lot and generally lived in Gringo-land. The exception was malaysia, where we had a villa set well apart from the main town and army base. I still remember the house. Having said that, it was hardly living with the locals, because it was almost in the jungle (beyond the garden!). It was down a dirt track and behind some rather fiercesome gates! Perhaps it had been built for a local or perhaps not. It WAS on stilts, albeit concrete ones. Sounds like you did a lot of traveling as a child. Did you get many opportunities to make friends with local kids along the way? This is a gorgeous condo and has such a low-cost! I love the fact that the landlady does your laundry! You guys have scored in a major way and Kim and I are totally jealous! Ha! Love it!!! Thanks Mike. Stay tuned and you’ll see the apartment we’re moving into today. It’s even better. And you and Kim are always welcome.